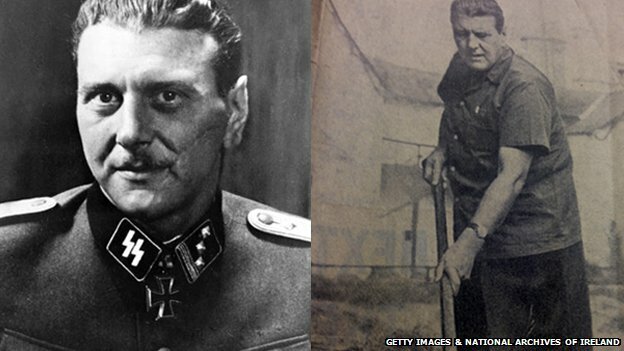 Otto Skorzeny was the Nazi’s top commando during World War II. Known as Scarface due to a large facial scar on his left cheek, he was not easily forgettable when he finally settled in Ireland after the war. While many would have thought he would not have been welcome in Ireland, the reception he received was one of admiration and interest for his role during the war, rather than of repulsion for his part in the Nazi regime. According to newspaper reports at the time, they hailed him as the Nazi’s most lethal weapon. Otto was of Hungarian heritage, born in 1908 in Vienna. He joined the Nazis in 1930 and fought on the front lines at the beginning of World War II. By 1943, Otto had worked his way up becoming head of Germany’s Special Forces and leading an elite squadron of SS commandos. At the height of World War II and the Nazi’s progression in Europe, Otto was asked by Hitler to lead the mission to rescue Italy’s Mussolini who had been removed from power and imprisoned in an isolated hill top location. Otto and his team flew in to rescue him in gliders and took on the whole fortress of Italian guards to successfully rescue the ailing ex-Prime Minister. After the success of the mission Otto was promoted to be a major. He went on to lead many top secret missions during the war, including an infamous operation to infiltrate Allied troops during the Battle of the Bulge, which saw him and his squadron dress up and play American soldiers in order to get behind Allied lines and hinder their defences. At the end of the war, Otto surrendered to the Americans and was put on trial in Dachau for war crimes. However, his case collapsed and he was cleared. He remained a prisoner of war for crimes in other countries and eventually escaped to Spain, the BBC News reports. It is thought he played a major role in helping Nazis to immigrate to South America in the post war years, and he himself lived there for a while as bodyguard to Eva Perón. Otto moved to Ireland in 1959, settling in County Kildare. While he was allowed into the country and to buy property, the Irish parliament did discuss his presence since it was causing interest in both Irish and English newspapers. They were also concerned about what activities he was undertaking since he had never renounced his affiliation with the Nazis. He was never granted a permanent residency visa so he returned to Spain where he retired and died in 1975.